6 November 2018. Passed away peacefully after a long illness bravely borne, surrounded by his loving family. Much loved husband of Estelle and loving father of Willis, Beth, Sharon, Lee and Lynne. Service in S Clarke & Son’s Funeral Church on Friday at 10.00am. Funeral afterwards to Movilla Cemetery. Family flowers only please. 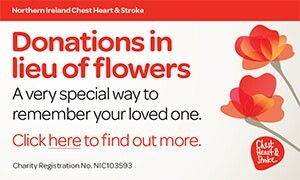 Donations may be sent if desired to Alzheimer’s Society, c/o S Clarke & Son Funeral Directors, 12 Court Square, Newtownards, BT23 7NY. Sadly missed by his wife, sons, daughters, grandchildren, great-grandchildren and the entire family circle. I am sorry to tell you that Victor ARMSTRONG has passed away.